Were the electronics makers of the world to have their way, every time one of your gadgets broke, you’d simply buy a new one. But most gadgets can be repaired, as the folks at iFixit have revealed time and time again. And the team’s newest DIY repair kit gives you all the essentials you need with just a $20 price tag. Just sixteen bits give you access to the guts of 99 percent of the gadgets in your home. You could easily spend hundreds of dollars assembling a toolkit that would let you open every last gadget on earth. But the team at iFixit studied their past teardowns and determined that you really only need 16 different driver bits to open 99 percent of devices that consumers regularly use—and regularly break. If you want to be able to open anything and everything that’s electronic, you’d need a toolkit with over 120 driver bits. That gets expensive. Which is fine if you do this sort of thing for a living, but for the average person looking to save a few bucks on replacing their iPhone’s screen, iFixit’s new Essential Electronics Toolkit seems like a much better deal. Can you tell the difference between a spudger and a jimmy? But the toolkit doesn’t only contain driver bits. 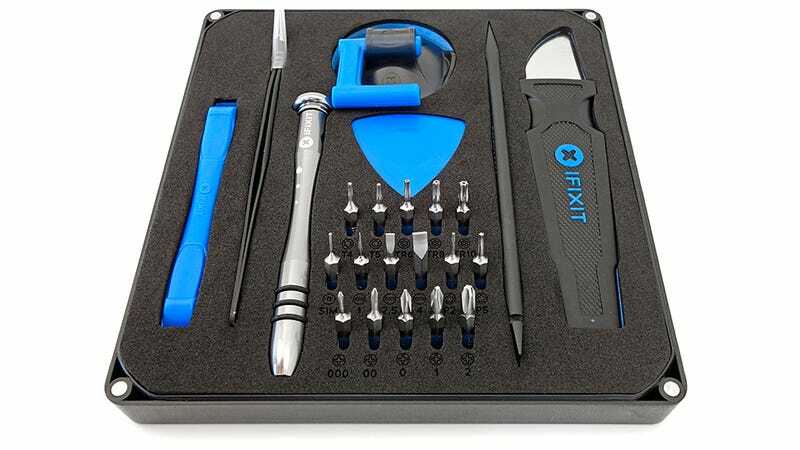 iFixit has also included other essential repair tools including: a reinforced plastic opening tool made from acetal resin, pointed tweezers with a curved tip, an aluminum driver, a suction cup with a handle for removing displays, various plastic picks for shimmying opening housings, a heat-resistant spudger, and a jimmy with a comfortable handle and flexible stainless steel blade for prying and scraping. Use the toolkit’s lid to keep track of every last screw you remove. Even the toolbox the Essential Electronics Toolkit comes in is useful, featuring a foam insert that holds everything secure, and a magnetically-attached lid that can be completely removed and used as a sorting tray for all of the tiny bits you’re removing that will eventually have to be re-assembled if you want your new and improved smartphone to actually work again.